Hypertension is increasingly being found in children and adolescence. The purpose of this study was to find out differences in the central arterial (aortic) blood pressure parameters in young adults with hypertensive and normotensive parents. 109 healthy volunteers between the ages of 17 and 25 years were enrolled for the study after taking consent. Brachial artery pressures and aortic parameters were recorded using PeriScope™ which determines aortic parameters and functional vascular age non-invasively based on oscillometric method. 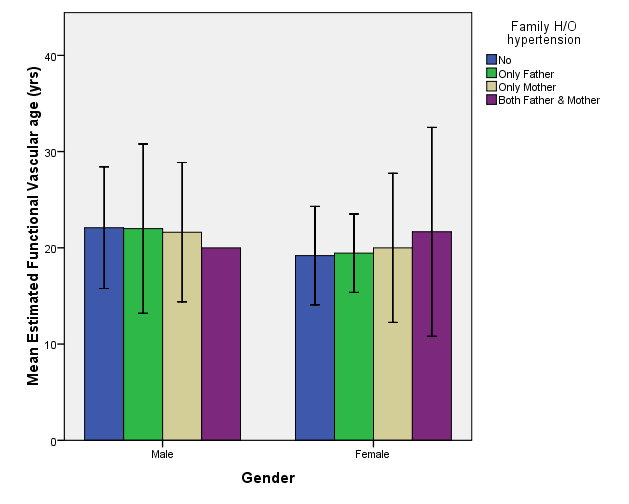 The results of this study showed no statistically significant difference between offspring of hypertensive parents and offspring of normotensive parents.